In New York City, more than 800,000 households do not have broadband connection. To help close the homework gap for these students, the New York Department of Education announced that the city partnered with its three library systems, Google and Sprint to distribute 5,000 free WiFi hotspots to public school students and families without home Internet access. The initiative is the next phase of the New York Public Library’s Library HotSpot program, which started in 2014 to help close the digital divide for more than 2 million New Yorkers without access to broadband Internet at home. In 2015, the program expanded to include Brooklyn Public Library and Queens Library, as well as Google and Sprint. The renter must attend a lending event at one of the three branches. Hotspots will be offered at 46 library branches run by the three libraries. The branches are located near the department’s Community Schools, or “neighborhood hubs where students receive high-quality academic instruction, families can access social services and communities congregate to share resources and address their common challenges,” according to a news release. The Library HotSpot program aligns with the White House’s ConnectED initiative to bring next-generation broadband to 99 percent of U.S. students by 2018. 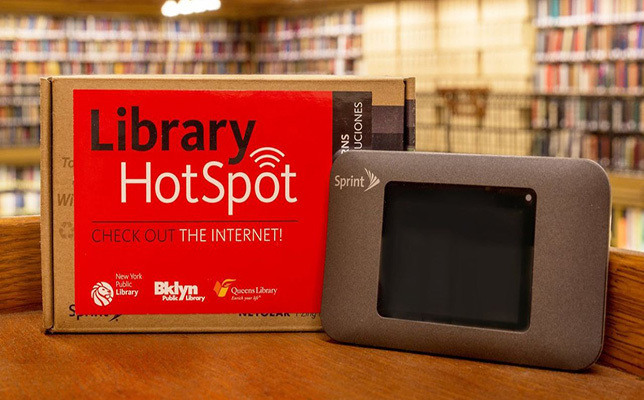 To learn more about the Library HotSpot program, visit the New York Public Library site.